MIAMI GARDENS, FL – Sometimes a nudge by a concerned family member can be what it takes for a person to visit the doctor. The month of October is designated for that purpose. For “Take Your Loved One to The Doctor” (TYLOD) month, Live Healthy Miami Gardens has joined forces with The City of Miami Gardens and Health Foundation of South Florida for the second year to encourage residents of Miami Gardens to visit their physician not just in October, but year round. 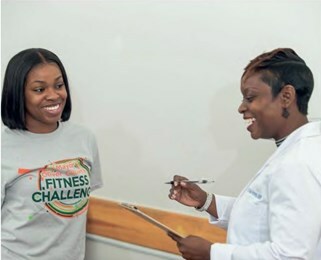 In the past two years, Live Healthy Miami Gardens and its partners have brought awareness to the importance of regular health care check-ups. With the TYLOD campaign, the goal is to inspire the community to be proactive with their health and increase the possibility of early diagnosis when the chance of successful treatment is better. City of Miami Gardens Mayor Oliver Gilbert is a TYLOD supporter. “Effective care for loved ones requires a holistic approach to their general well-being. That includes taking them to the doctor for annual checkups and taking advantage of preventive care to avoid serious health conditions,” said Gilbert. Residents without a regular primary doctor can visit the Center for Children and Family Enrichment (1825 NW 167th St, Miami Gardens, FL 33056) and Jessie Trice Community Health Center (4692 NW 183rd St, Miami Gardens, FL 33055), both located in Miami Gardens, on October 19, 9 a.m. to 5p.m.for a free check-up. For more information on how to take the Take Your Loved One to The Doctor Pledge, please visit livehealthymiamigardens.com.